This is both one of our guest’s favourite dishes when we serve dinner at La Villa de Mazamet & is the the recipe requested the most. By twice-baking the soufflés you take the majority of the stress out of serving these for a dinner party and they can be made a full day in advance too. Get yourself organised in the kitchen with the ingredients & equipment on your work surface. Start by greasing your ramekins, I line the bottom of mine with little circles of baking paper too. Using butter at room temperature and a silicon pastry brush, work in upward strokes (which helps with an even rise of your soufflés). Place on your baking sheet, cover with film and pop in the fridge. Grate your cheese, keep 20 grams aside in the fridge for when you bake for the second time. Please the milk, bay, nutmeg, onion and a couple pinches of salt & pepper into your medium size saucepan and cover with the milk. Weigh out your butter & flour – place the butter in your large saucepan and keep the flour to hand. Chop your chives and keep to hand. Separate the eggs, placing the egg white in a large bowl and the yolks in a smaller one. You are now ready to start to make soufflés! Gently heat the milk until just below boiling point and then leave to infuse for 5 mins; pass through the sieve into your heatproof jug [you only want to reserve 500ml (1/2 litre)] Gently melt the butter and, once completely melted, add the flour and stir with your rubber spatula until combined, then cook gently, stirring continuously, for around 2 mins until it is a straw-like colour. Slowly add the milk (about a 1/4 at a time) each time stirring until the milk is fully absorbed and combined into a think paste. When the last of the milk is added, continue to stir & cook over a low heat for 2 mins. Remove from the heat and immediately beat in the Dijon mustard, chives and cheese. If you find that the cheese has not fully melted, return to the heat for 1 min. Spoon the mixture into a large bowl and set aside for 5 mins (to allow to cool). Whilst the mixture is cooling, whisk your egg whites until they reach the stiff peak stage and set aside. Remove your ramekins from the fridge and heat your oven to 200 degrees (centigrade). Once 5 mins have elapsed, beat in one egg yolk at a time until they are fully combined, then add roughly a 1/4 of the egg white milk and gently stir in to loosen the mixture before gently folding in the remainder of the egg white. Finally, carefully spoon the mixture into the ramekins so that it comes 2/3rds of the way up to allow space to rise – make sure your ramekins are evenly spaced apart. Place in the oven for exactly 15 mins, remove and place the tray on a cake airer. The soufflés will start to sink almost immediately and you need to very carefully tease the tops inside the ramekins as they do. Once completely cold, run a sharp knife around the inside of the ramekin (it is easier to do this by placing the ramekin on it’s side on top of a tea towel) to help remove the soufflés and then place on a baking sheet with a silicon liner or baking paper. Cover with film and pop in the fridge until needed (up to one day in advance). To make the Gruyere cream; place the cream and some seasoning in a medium size non-stick pan and bring to a gentle boil so that it reduces and starts to thicken. Add the grated Gruyere and stir until fully melted; set aside. To bring your dish together – place your chosen serving bowls in an oven on a low heat, or in a plate warmer. 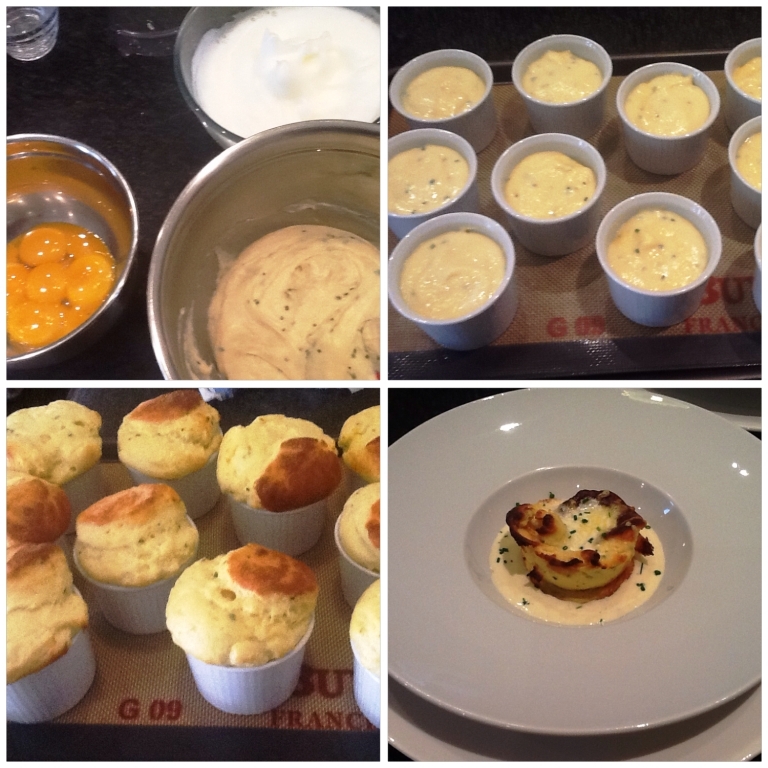 Heat your main oven to 180 degrees (centigrade) & take your soufflés from the fridge, remove the film and drizzle a little cream over each and top with the reserved grated cheese and pop in the oven for 9-10 mins. Re-heat your Gruyere cream. Roughly one minute before removing from the oven, place your bowls on liner plates and spoon a little of the cream into each bowl. Remove the souffés from the oven and place on top of the cream and sprinkle a little chopped chive around it to finish the dish. NB – if you are not having 12 for dinner, still re-heat them all and select the nicest looking ones for you and your guests – the others you can thrice-bake for yourself another day, they make a great little accompaniment to a roast dinner.